New to aerial hoop? Don’t worry, we got you! In our introductory level you will not only learn the fundamental techniques and build confidence with the apparatus, but you will also learn tricks and poses that we promise will have you hooked for more. What to wear: Comfortable clothing that covers knees, elbows and torso are a must. No footwear required. Sitting on a hoop or hanging off your knees on the bottom bar is beginning to feel pretty good huh? This is the level for you. Take your aerial hoop skills to the next level and learn the beautiful Gazelle Split, Mermaid, Front Balance and other timeless aerial hoop classics as you build your strength, stamina and flexibility for more advanced moves. Splits, splits and MORE splits! In Intermediate hoop you will learn to split in every which way and more. But it’s not all about splits. Learn graceful, dynamic sequences rolling in, around, and through the hoop that will have you getting your left and right, from your up and down all confused. It’s worth it! So first there was the knee hang, then the elbow hang. Now there’s the heel hang and the toe hang. Oh! but wait, there’s also the neck hang and the ever-elusive Reverse Meathook! 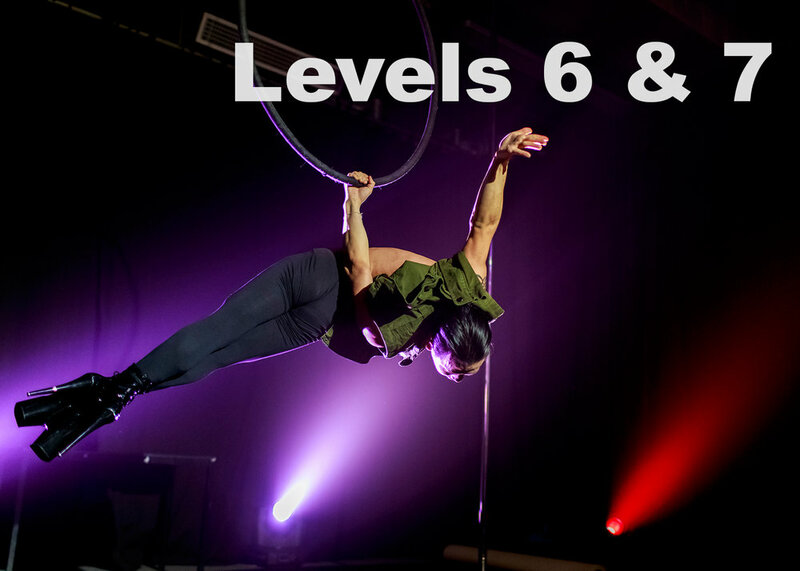 In our advanced level, aerial hoop sequences become even more dynamic and exciting (or maybe daredevil) as you learn to roll, twist and drop under the guidance of our experienced instructors. Prerequisites: 1 or more years of training in hoop techniques and can demonstrate a minimum of 3 unbroken pull ups. Must be comfortable working with the top bar.